Del. Mark Cole speaks during Virginia's redistricting debate. RICHMOND, VA - As the General Assembly’s session enters its second half, both the House and Senate have passed competing plans on how to redraw legislative districts. But groups that have been fighting gerrymandering prefer the Senate’s proposal, saying it would do more to take politics out of the process. Lawmakers on both sides of the aisle are concerned that without the proper provisions, the General Assembly may be doomed to repeat mistakes made in 2011 when legislators gerrymandered several Virginia districts for their own benefit by diluting the voting power of African-Americans. Those districts were later struck down by the U.S. Supreme Court and had to be redrawn. Some legislators say there’s an easy fix to make sure it doesn’t happen again: Create an independent commission to redraw the lines, and take the process out of the hands of politicians. At the start of the legislative session, lawmakers offered nine different proposals to establish independent redistricting commissions. They have now been narrowed down to two. 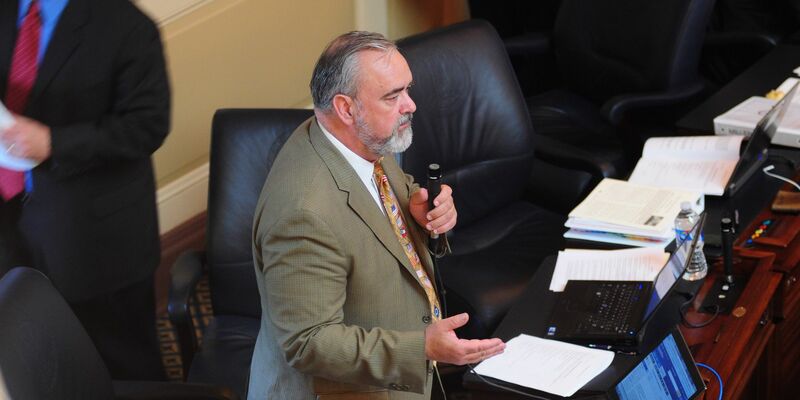 Senate Joint Resolution 306, sponsored by Democratic Sen. George Barker of Alexandria, sailed through the Senate last week with unanimous support. House Joint Resolution 615, sponsored by Republican Del. Mark Cole of Spotsylvania County, was narrowly approved by the House on Monday on a party-line vote, 51-48. · SJ 306 would create a 16-member commission made up of eight General Assembly members and eight citizen members. Of the eight legislative members, four would come from the Senate, and four would come from the House, with equal representation given to each political party. Any plan drawn up by the commission would have to be agreed upon by at least six of the eight legislators and six of the eight citizen members. The plan would then be sent to the General Assembly for an up-or-down vote. The General Assembly would not be able to make any amendments to the plan. · HJ 615 would create a 12-member commission consisting of six Democrats and six Republicans, none of whom could be members of the General Assembly or U.S. Congress. The members would be selected by the speaker of the House, the Senate Rules Committee and the governor, and any plan drawn up by the commission would have to be agreed upon by at least eight of the 12 members. The plan would then be introduced in the General Assembly as a bill, and legislators would vote on the plan. The governor would be removed from the process and would not have the power to approve or veto the bill. Barker’s amendment has garnered support from fair redistricting advocates, but they have concerns about Cole’s commission. Princeton Gerrymandering Project, a nonpartisan redistricting group based in New Jersey, issued a statement Sunday saying that Cole’s constitutional amendment could “backfire” and increase the possibility of partisan gerrymandering in the commonwealth -- the opposite of its intended effect. “It’s sold as nonpartisan reform. But we find that it’s more likely to entrench whatever party is already in control,” director Sam Wang wrote. Voting rights advocacy groups Progress Virginia and New Virginia Majority issued a joint statement slamming Cole’s amendment after it was sent to the House floor last week: “The GOP’s proposal simply replaces one bad system with another,” said Progress Virginia executive director Anna Scholl. The editorial board of Lynchburg newspaper The News & Advance has come out in support of Barker’s amendment. In an op-ed published Thursday, the board wrote that, while both plans signal the General Assembly’s willingness to change the current system, SJ 306 was “far preferable” to HJ 615. Advocacy group One Virginia 2021, which has pushed for a nonpartisan approach to redistricting in Virginia, has also expressed support for SJ 306, as has former Virginia Gov. George Allen, a Republican. Allen and One Virginia 2021 have teamed up for a five-city town hall tour to highlight the need for bipartisan redistricting reform. Advocates are watching anxiously as the two amendments head off to the House and Senate. If either is approved by the General Assembly, it will face a long road to be added to the Virginia Constitution. Constitutional amendments must pass in two legislative sessions and then be approved by voters in a statewide election. Lawmakers will have to act quickly to ensure that an independent commission is in place by 2021 when the U.S. Census Bureau releases new population and demographic data. If not, the same process used in 2011 will be used again in 2021.